A great pattern not only for flyfishing for bass, but also effective on steelhead, brown trout, and salmon. According to Ian James' Fumbling With A Flyrod, "this fly was first tied in 1985 by David Train as a still-water rainbow trout fly for use in English reservoirs and ponds." Ian James writes "It works, especially when the water is very cold or off-colored. An all-black version of this pattern is a highly productive dressing for fishing at night. It is well worth having a few of these in your box. 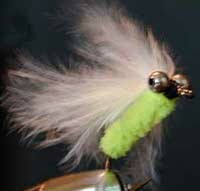 It is best to fish this pattern on a floating line without a dropper. Eyes: A pair of silver bead chain. Optional: Ribbing of flat silver tinsel.